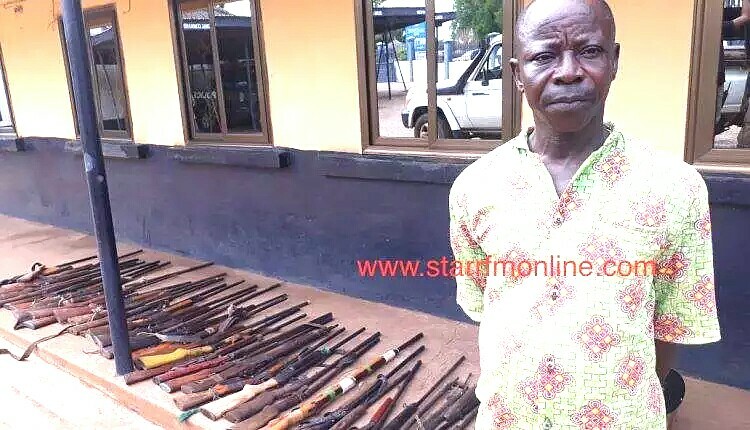 The Upper West regional police command has arrested a man believed to be the supplier of fire arms to robbers in the region and other parts of the country. The police retrieved 35 single-barrel guns including one belonging to the Ghana Police service from the hideout of the prime suspect Bartholomew Daryenkye. Other items retrieved in the operation include two locally manufactured pistols and 22 barrels and a packet of large cartridges. Briefing the media, the Deputy Upper West regional commander ACP Peter Ndekugri described the operation “as one of the biggest catch” of the Service in the region. “We’ve adopted a strategy to get to the suppliers and not necessarily with those with criminal items,” ACP Ndekugri stated. “We are prepared to get to the suppliers. We are appealing to the public when you see someone with a gun inform us and it will lead to the supplier. It is one of the biggest catch we have seen in Upper West,” ACP Ndekugri stressed. The police chief has therefore ordered people in illegal possession of weapons to voluntarily surrender them or face arrest. The regional command also warns recalcitrant offenders would be prosecuted. The order follows the seizure of some fire arms at Loho barrier, a spot near the Wa Municipality. The suspects have been identified as Nyame Purokiamah, 61, and Michael Sonkora, 32. Their arrest led to the rounding up of the gun supplier Daryenkye and his wife. The commander served notice the police are on the look out for more accomplices. August 8, 2018 in Business.